After leaving school Adam worked at NM Rothschild for two years prior to going to Bristol University to study history. 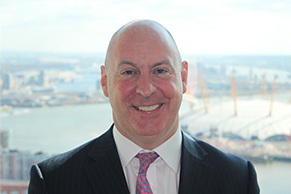 Adam trained at CMS and moved to Clifford Chance on qualification in 1997. Adam always wanted to be in-house on the commercial end and moved to Rolls-Royce PLC in 1999 and was the General Counsel of its financing arm, Rolls-Royce Capital. In 2004 Adam moved to GE Capital as its UK General Counsel for commercial finance. In 2007 Adam moved to a fund that did not survive the financial crisis and he returned to private practice at Jones Day in 2009. Adam joined Barclays in 2012 as Head of Legal for trade finance. In 2015 Adam became the Head of Legal for Barclaycard UK with a team of 12 lawyers. Adam has recruited lawyers, paralegals and managed legal teams for over 10 years. His legal experience spans debt finance, asset finance and aviation, restructuring, trade finance, receivables and structured finance, consumer lending, credit cards and payments. Adam lives in Epsom, is a keen cyclist and motorcyclist and is married with two children. Adam grew up in the Medway Towns, Kent. His mother worked in kitchens and his father was a skilled factory worker. Adam went to a local grammar school, played rugby for his county and became head boy. He is passionate about equal opportunity: “don’t treat people differently just because they are different”. He is particularly interested in social mobility. Adam is proud to work for Barclays because he feels that it leads the way in promoting opportunities for young people, has a very active women’s network, supports military veterans transition into civilian life and is a leading LGBT employer. Adam has joined the advisory board having been committed to Aspiring Solicitors from its launch. Together with his colleague David, Adam has supported Aspiring Solicitors by attending and organising its events, becoming Barclays first professional ambassador and promoting Aspiring Solicitors to several law firms.